As an investor, your ultimate goal is to have as many qualified lenders as possible quoting your products, while reaching more potential borrowers. Fortunately, Mortech aligns with this way of thinking, and works to provide the most accurate and up-to-date investor rate data to our customers, so that they can provide those products to their borrowers. But what makes being a Mortech investor so beneficial is the amount of lenders that can use your rate data to find the best product for their borrowers. 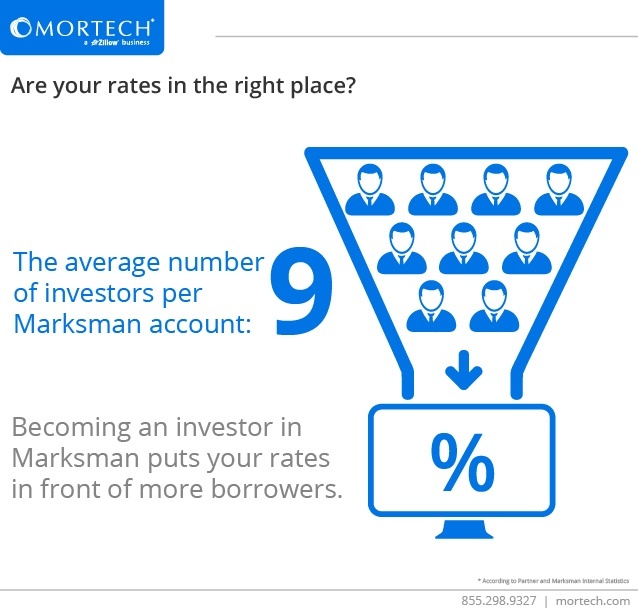 Lenders who use Marksman for pricing use, on average, rate data from nine different investors when finding best execution pricing. This provides them with flexibility to offer the best possible product and rate to their borrowers. As a Marksman investor, you would have a dedicated team working for you to ensure that your rate data and approved lenders remain up to date and consistent, by being provided an open line of communication. This includes supporting any major rate sheet changes or adjustments that may come up. This communication doesn’t just stop with Mortech, though. Have a specific product or special offer you want highlighted? Mortech helps market your product offerings to our lenders so that it can be noticed and offered immediately. Want to know how everything is going to look and work in the system? Investors can also use a test account to access real-time rate updates, pricing and eligibility results, adjustments, and guidelines. This allows you to see all of your data, and how our functionality presents it to our mutual lenders. Want to find out more? Reach out to us, and find out why you should become a Mortech investor, including getting your rates and products in front of more borrowers, today.